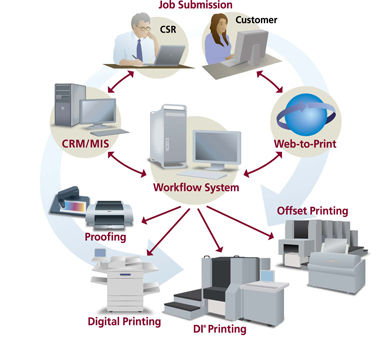 Presstek offers workflow solutions for any size commercial print operation from small commercial shops to larger operations that must support multiple digital and conventional output devices. These integrated, flexible solutions can be customized to fit a business’ particular production environment. Plus, Presstek’s solutions are scalable so you can protect your initial investment by adding new functionality as your business grows. Our robust workflow offerings, include end-to-end business flow automation from job submission through billing, our workflow solutions are designed to automate and streamline the production process.